Vijay Sethupathi and Nayanthara the two selective actors in tamil industry. 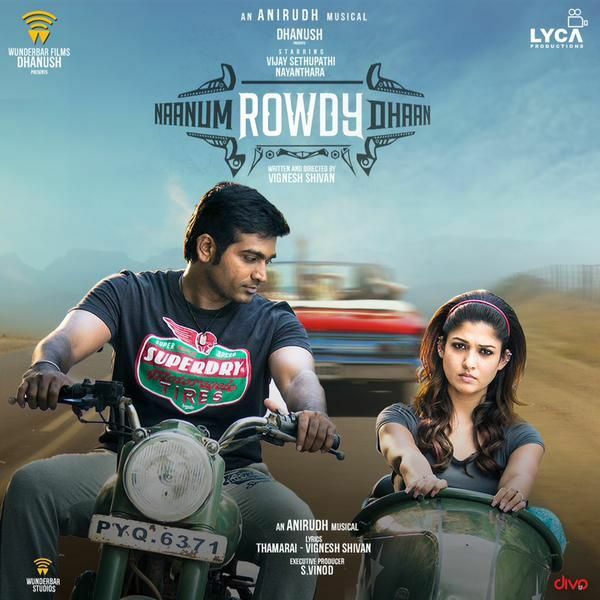 So that everyone looking forward to “Naanum Rowdy Dhaan” with more expectations. And in one word can say that , the movie surely full fill your overall expectations. Vijay Sethupathi's only ambition is to become a rowdy which contradicts with his mother's (Raadhika) dream of making him a police officer. He manages to become a self-made ruffian and that's when he meets Nayantara who comes seeking his help, only to realize that he is not an actual rowdy but a fake. When Vijay falls in love with her, he learns that her only aim is to eradicate Parthiepan. What is the reason behind her rage? Can Nayanthara and Vijay Sethupathi kill a fierce person like Parthiepan? Lets go to theater for the answer . The movie is watchable one but the bad on-screen chemistry, always which looks extremely artificial between the lead pair spoils the first half, slow screenplay disfigures the second which is largely saved by Parthipan alone. The plot might come across as a serious revenge drama, but Vignesh Shivan displays a lightness of touch throughout that makes the film so much fun. And, he keeps things breezy even when situations get serious. There is always a funny one-liner or a bouncy musical cue waiting to make us relax, and the comical and emotional beats of the film are brought together seamlessly in an admirable way. He is aided in this task by his music director Anirudh's rollicking score (and songs, which, for a change, are not bathroom breaks but add to the mood of the scenes), cinematographer George C Williams' gorgeous frames and editor Sreekar Prasad's cuts which keep even the serious scenes fleet-footed. The segment where Pandian and his friends try to kidnap Killivalavan is among the hilarious moments we have seen in Tamil cinema this year. The plan, as we expect, goes gloriously wrong, but is comedic gold. The director also adds a bit of novelty to the storyline by showing us certain scenes and then going back to them at a later stage to give us a complete picture. Early on, Kadambari is brought into the police station when she is found wandering alone at night and picking up a fight with the cop. And when Vignesh shows us what had actually happened, things fall into place with an ease that is to be seen to believe. There are a couple of moments where the film threatens to descend into melodrama. One happens when Kadambari gets news of her father's death and mourns for him. This scene goes longer than necessary and is shot in a self-conscious fashion (a close-up of Pandian and Kadambari's lips) that only yanks us out of the film. The other takes place in the midst of a shoot-out when we are told something has befallen Pandian's mom. We get a pay-off to this scene during the closing credits but it only comes across as indulgent. Nayantara as a deaf girl has excelled in each and every scene. Though it is one of the positives of this flick, that is also one of the negatives as she has completely overpowered Vijay Sethupathi all the way through. The actual problem here is Naanum Rowdydhaan gives us the feeling that its director Vignesh Shivan might've completely forgotten about the factor called 'on-screen chemistry' between the lead pair. Parthiepan is the real strength of this movie in the performance department. His witty one-liners have worked like a spell as it makes you laugh genuinely, unlike other comical portions involving Rajendran and RJ Balaji. Anandaraj deserves a mention as well as the veteran has delivered the goods in the limited screen space that he has been allotted. George C Williams' cinematography and Sreekar Prasad's editing are top notch and are some of the biggest positives of Naanum Rowdydhaan along with Anirudh's brilliant and apt background score. Songs too have been placed well which is refreshing to see in a Tamil movie. Predominantly, this movie is technically strong. Vignesh Shivan's directorial skills deserves a special mention, for the filmmaker has a knack of fabricating an enjoyable film out of an ordinary story. A watchable flick with fun filled climax and pre-climax portions.